As I promised in my last entry, I made it to Knit New York on Saturday morning. I know it's not a popular opinion, but I was a little disappointed. The space was beautiful and I enjoyed a tasty bagel, but the yarn just didn't do it for me. Perhaps it had something to do with the abundance of wool and the 100% humidity, but I ended up only buying a single pattern pamphlet. I fared better at Downtown Yarns, and enjoyed it much more. They were very nice and had a wonderful selection. Even still, I left only with 2 skeins of Cascade 220 -- hardly the yarn purchasing extravaganza I had planned. But don't worry, I didn't leave New York empty handed. Posted by shannon at August 29, 2004 11:00 PM | For related posts: Knit Gringa, Knit! Congratulations! I'm so excited and happy for you. 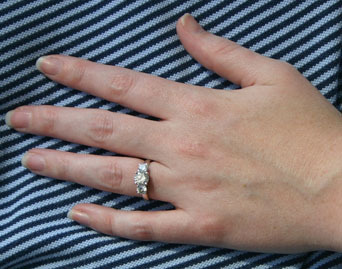 Very nice ring and guess what, your blog now has a picture of a little bling-bling! I've enjoyed reading your blog for a little while and it's nice to see you posting again!